The Transportation Security Administration (TSA) is starting to look at luggage in a whole new way. A way that’s faster, more efficient, and will get you through the security checkpoints much faster. It’s called 3D screening and it looks at your blag in three dimensions, not the traditional two. According to an article in USA Today, the TSA announced plans to begin testing a 3D scanner for carry-on luggage. The device, created by Analogic, has already begun testing with American Airlines at New York’s JFK airport. The test began in late July and uses a ConneCT scanner. The partnership with Analogic and TSA could transform aviation security by adding state-of-the-art computed tomography (CT) technology to the security checkpoints, according to José Freig, American’s chief security officer. “At American, we are always looking at ways to invest in technology that raises the bar on global aviation security while improving the customer experience,” Freig said. Advantages of 3D scanning include being able to rotate the image digitally to examine a suspicious item without unpacking a bag, and program capabilities that would highlight suspicious materials. 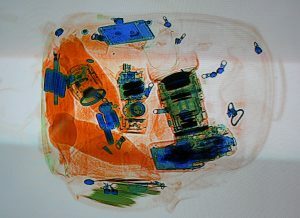 Passengers are cramming more into their carry-on bags, which make it more difficult for a standard 2D X-ray (which is what a TSA agent typically sees when they scan luggage). The TSA has been using 3D screening technology on checked baggage for some time. Since June 2017, the TSA has been testing CT machines in Phoenix and Boston terminals. As technology becomes less cumbersome and increasingly more manageable, the TSA expects to increase its usage, which will not only improve security, it will speed up the checkpoint lines as officers will no longer be checking items by hand. According to TSA Administrator David Pekoske, the use of CT technology substantially improves TSA′s threat detection capabilities. He hopes to test 40 machines across the US this year. “This partnership will allow us to deploy new technology quickly and see an immediate improvement in security effectiveness,” Pekoske said. The $71 million funding for next year’s 145 machines is currently under Congressional debate. TSA has been testing CT machines from three manufacturers: Analogic, Integrated Defense and Security Solutions and L3 Technologies. Have you experienced these 3D CT scanners in your travels? Are you looking forward to seeing them, or does it not matter so much? Let us hear from you on our Facebook page, or on our Twitter stream.